Word of mouth publicity is crucial for any brand, and in the smartphone world where competition is very intense and companies are trying very hard to get the consumer’s attention, user validation and testimonials are even more important. The 91mobiles Consumer Insights Study surveyed over 15,000 smartphone users in India, and collected tons of invaluable data in the process. Based on the analysis, here’s what we were able to find out on the most recommended smartphone brands. Do note that the inferences drawn here are representative of the 15,000+ survey respondents. The entire study is embedded below, but read on to find out detailed insights on phone brands that rank high on word-of-mouth and value-for-money factors. 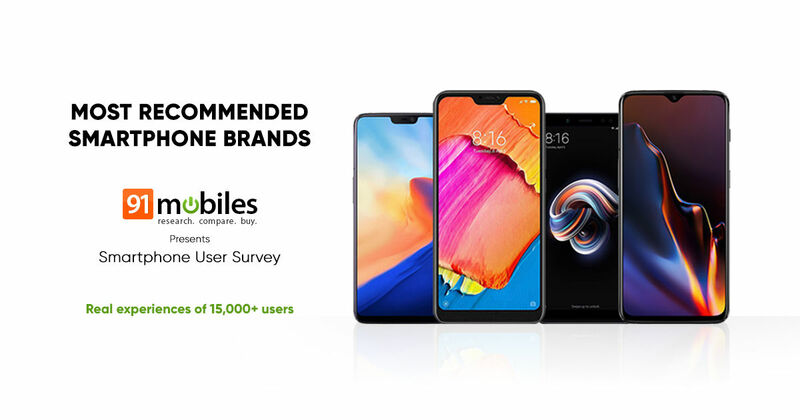 Xiaomi scores pretty high on user recommendation as well, with about 83 percent of its users willing to recommend the brand to others. The reasons for this, in our opinion, may not be very surprising. Xiaomi is very popular in the budget and affordable segment, mainly due to its Redmi series which includes some powerful phones that are priced quite attractively. More than just the fact that these smartphones are all quite compelling in their respective segments, the brand has done quite a few other things that have taken it to the top in the country. These include a powerful offline strategy to ensure availability isn’t a concern, local manufacturing to keep prices low, focus on customer service and expanding its service network. Over and above this, Xiaomi now has a strong strategy to grab a share of the pie in the affordable flagship segment with its new sub-brand POCO. It’s worth noting that Xiaomi’s earlier efforts in the flagship space (with the likes of the Mi 4, the Mi 5 and the Mi MIX 2) haven’t really been very successful, but in the POCO F1, it finally has an offering that can possibly help it move up the value chain. Not to mention the fact that Xiaomi has also managed to grab consumer attention in the smart TV space, which is segment that has picked up quite a bit in the country in recent times. With over 82 percent users willing to recommend Huawei and Honor, the share for these two sister brands is pretty high too. While Huawei’s presence here is surprising, Honor’s success can be attributed to a carpet bombing strategy it seems to have used with its offerings. By launching a bunch of different smartphone models with quite a few variants of each, Honor has covered different price points in the affordable segment with many well-designed and feature-rich phones… a strategy that seems to have worked for it to some extent. Honor’s parent brand Huawei is trying to make inroads into India’s smartphone market with renewed vigour, and its offerings like the P20 Pro, P20 Lite, Nova 3 and Nova 3i, seem to have earned enough consumer trust to earn recommendations from them. Apple ranks high on user recommendation too, with over 80 percent of its users recommending it. The reasons for this seem pretty straightforward. iPhones are iconic, aspirational devices, and many are enticed by their flaunt value, capabilities, features and camera prowess. Apple’s iOS mobile platform is known for its fluidity and ease of use, and iPhones generally tend to last long thanks to great software optimisation and timely OS updates. However, it’s Lenovo that seems to have fared the worst, with just 49 percent of its users giving it the thumbs up in terms of recommending the brand to others. Worth mentioning that while Lenovo was quite popular In India at one point in time, especially with its K series of smartphones, it disappeared in the middle for about a year or so, allowing competitors to gain ground. Add to it the fact that a large chunk of our survey respondents reported issues like slowdowns and having to take their phones to a service centre to fix issues, and it’s clear why Lenovo didn’t fare well here. Apart from the insights on the most highly recommended smartphone brands in India, we also have analysis on brands that are rated high on value for money. We asked respondents to rate their current smartphones on a scale of 1 to 5 on value for money, with 5 being the highest, and must admit that the answers we got weren’t too surprising. Turns out, over 90 percent OnePlus users rated their devices 4 or higher, making it the brand that scores the highest on VFM. This is understandable, since the so-called flagship killers from OnePlus do offer a lot of bang for the buck, thanks to the top-notch specs and relatively pocket-friendly pricing. Xiaomi and Honor scored high too, with 76 percent of their users rating their phones 4 or higher on value. Both these brands are known for offering well-specced smartphones which are priced well. On the negative side, brands like Samsung, Motorola, and Vivo and Lenovo sit closer to the bottom. While Lenovo’s presence right at the bottom of this list (with 55.5 percent of its users rating it high on VFM) seems understandable due to the reasons we mentioned above, the fact that even Motorola and Vivo don’t fare well seems a tad surprising. Samsung, with over 61 percent of users rating its phones high on value, also seems weak when compared with others. The reason for this could be the fact that while Samsung has always been a very strong brand, its affordable smartphones (such as those in the J series) can’t match offerings from others like Xiaomi and Honor in terms of the specs and pricing. Overall, OnePlus seems to be doing a lot of things right, and it’d be interesting to see how things go from here.